Most people are familiar with the letter of recommendation, but not as many know about the letter of recommendation waiver. It is a brief document that says the person the letter of recommendation was written for gives up their rights to view the LoR. Why does this matter to you? There is a reason why a big deal is sometimes made over the small waiver. Letter of recommendation submissions that students have not waived access to are given less consideration than submissions that have a waiver. It is generally felt that recommenders will not give an unbiased recommendation if the student can access and see what they have written. By signing below, I agree to waive my right to access and examine, now or at any time in the future, the letter of recommendation (or copies) written by the recommender named above. Waivers of access to letters of recommendation are optional and voluntary. Students cannot be forced to sign a waiver of access. Waivers of access may be requested from students by schools, but the student may not be denied admission, awards, employment, or any service or other benefit if they fail to supply waivers. Students always have the right to access their letters of recommendation, unless they sign a waiver giving up that right. Students need not waive their right of access to letters of recommendation, but most professors will not provide a letter of recommendation for a student unless that student waives their right of access, the same situation, for example, with waiver letter for immigration. Professors and other recommenders cannot be forced to write a letter of recommendation. In fields like law and medicine, letters of recommendation from professors are critical when applying for advanced education and employment. It is up to each individual to decide whether or not they wish to sign an access waiver. Letter of recommendation submissions are part of your educational record and you have the right to view them. Our writing a letter of recommendation services and site will provide you with all of the help that you need with your LoR. We will offer you advice about the best ways to request a letter of recommendation, who to ask to write your letter, and also what information you should provide to make their job easier. 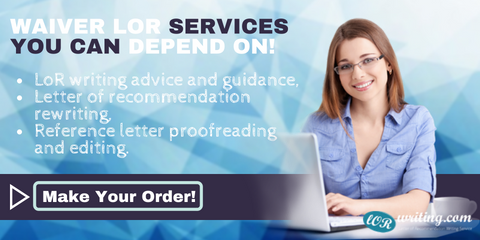 We can also provide you with all of the support that you need with actually writing a letter of recommendation or editing it to ensure that it is error free and written in the most effective way. Our services are available around the clock and our experts will work with you to gather all of the information that is required for effective writing. The help that they provide is tailored to your needs and will always result in well written letters that are written to your specific requirements. 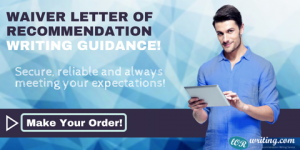 Should you feel that your letter of recommendation for MSc program needs any improvement at all our staff will offer unlimited revisions and will continue to work with you until the letter meets your full and total satisfaction. Consult an online professional in writing a waiver letter of recommendation should you need one. Call them up today!